If you are following 31 Ways To Celebrate The Holidays By Helping Animals, you know that today is all about providing fospice – hospice care for a senior or terminally ill shelter dog or cat. While sharing a long, happy life with an animal is a wonderful thing (the best), spending a few months, days, or even hours with a dog or cat who has never known kindness or love is just as amazing. It’s all about living in the moment and rewriting their story with a happy ending – helping homeless animals leave the world knowing they are safe, cherished, and finally home. You get back way more than you give and some pretty good karma, too. Cleo was my once-in-a-lifetime, feel-good, rewrite-the-story-and-make-the-ending happy, fospice cat. Some cats, like some humans, travel a bumpy road in life. Through no fault of their own, they are bounced from one home to the next, surrendered to shelters or left to fend for themselves on the street. Cleo was one of those cats. Was he serious, I didn’t know. But listening to his wife crying in the background, I assumed so and told him to bring the cat right over, no questions asked. 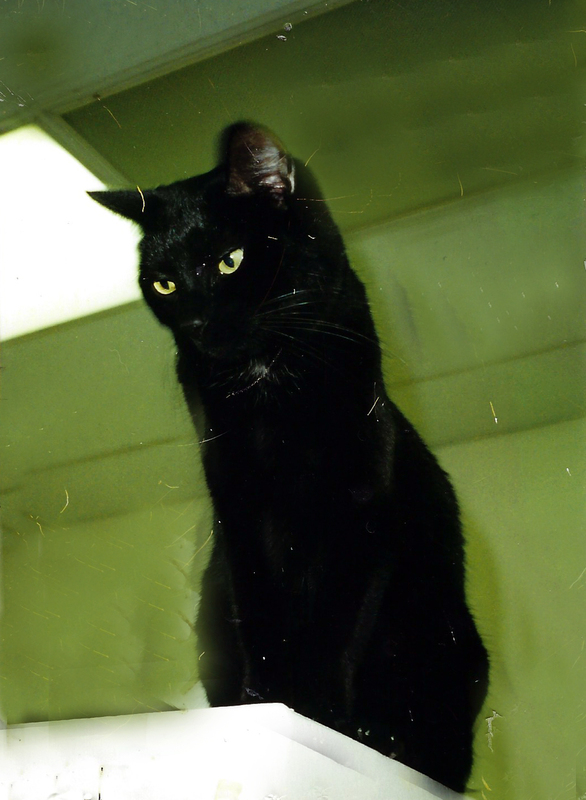 Cleo was a ten-year-old, petite black, declawed cat with piercing eyes and a furrowed brow. When she arrived at the shelter, she also had a furless nose from pressing against the basement door, trying to escape. She didn’t care for other cats and was a bit choosy with humans, too. 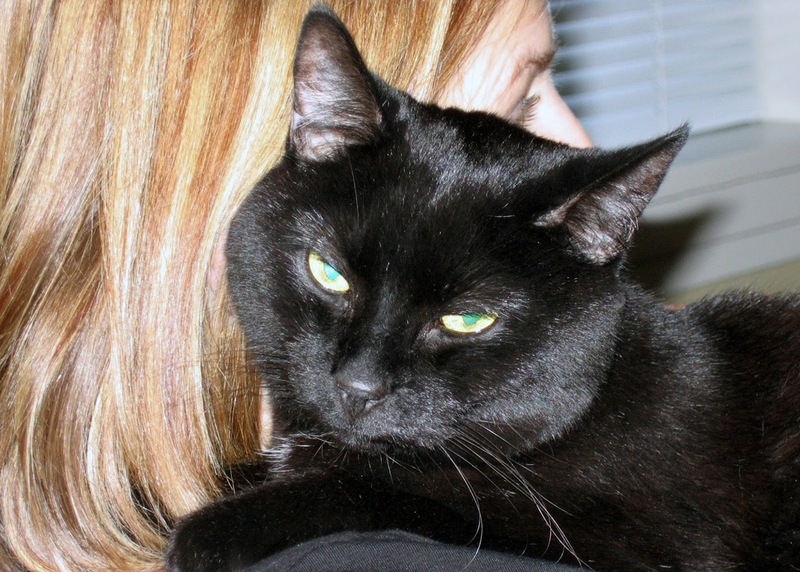 Adopters skipped right over her – no one was looking for an older, crabby black cat. Cleo had been hurt and it showed, swatting and hissing at even the kindest of volunteers. She had a sharp-tongued, angry meow that, combined with her mean right hook scared people and cats away. Looking back, I think Cleo pegged me pretty early on as her only ticket out of the shelter. Regardless of the weather, sub-zero January or sweltering July, she waited for me in the front window. While the other cats interacted with neighborhood children who knocked on the glass and waved, Cleo did not – and she soon became known as “the mean one.” But when she saw me, she would leap out of the window and run to the door, her eyes going from angry slits to wide-eyed wonder. 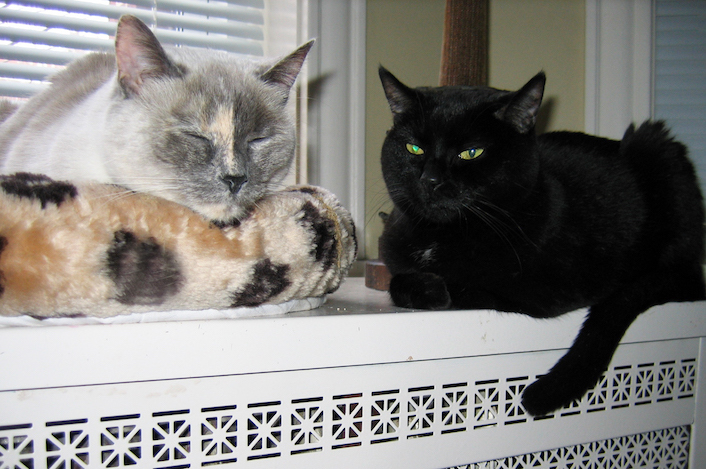 Cleo wasn’t crazy about our other cats, but she eventually joined them for naps on the radiator, movie night on the couch, and kitty pile-ups on the bed at night. Her crabby cries changed to sweet chirps and each morning she led the happy prance to the kitchen for breakfast. We discovered that behind the swats (and the mean right hook) was a sweet lap cat, afraid of rejection. She lived with us for two more years – celebrating holidays, the birth of my daughter, new jobs, moves, and lots of ordinary days that, when bound together, make years that matter. When I was pregnant, Cleo would sleep on my stomach and chirp when my daughter kicked. We weren’t sure she would meet her human sister, but Cleo lived until August 2006 when my daughter was six months old. Was it hard taking care of a newborn and a cat in hospice. Yes, it was. But life is not supposed to be perfect or easy and often the most sacred things are also brutally hard, but in a lovely way. Obviously not all hospice pets have such remarkable second acts. We have provided hospice care for several cats and while none of the others lived as long as Cleo, their final days were in a home surrounded by comfort and love – and for a cat who has been abandoned, betrayed or abused, that’s all that matters. Shelters are filled with cats like Cleo who probably won’t get a second chance. They will die alone, as if they never existed at all, only to be replaced by another cat who may not get a second chance either. This holiday season why not give the ultimate gift? Visit your local shelter and inquire about fostering a senior or providing fospice care for a shelter dog or cat. While your time together may be brief, you might just find your once-in-a-lifetime, rewrite-the-story-and-make-the-ending-happy, heart-cat (or dog). Kindness matters. Please forgive the low quality photos. My photography skills have clearly improved in the last 10 years. Our shelter here just had a tv blurb about doing hospice for elderly/sick shelter pets. It is a wonderful program. I know people get angry over pets being surrendered but in a neglect or abuse situation it is a gift for the animal to move to a safe location.I've never heard of hospice for pets but it seems the logical step forward in foster care. I've also noticed the term forever foster turning up at some rescues for dogs physically, behaviorally, or emotionally deemed too challenging to place who the rescue will pay to live out lives in rescue. Hospice care for those who need it is a true blessing! The giving and life changing works both ways.I love that! Bless you for taking care of Cleo and making her last days happy ones. Cleo was lucky to have found you when she needed you most. A lovely post! Fostering is top on my list, when I retire. So glad the shelter gave you a chance to care for Cleo – and Cleo apparently wanted it to work out as much as you did. We're so glad Cleo spent her last days out of the shelter and in a happy home. What an amazing gift you and Cleo gave each other! Our senior Shasta blessed us beyond measure! It is so difficult to not have them for a lifetime but the memories of the time together are precious! What a beautiful story. Cleo may have had a rough start in life, but you gave her a happy ending. Thank you for that, and for sharing this with us. The best part?!? The "gift" is repaid a thousand times over in love and companionship. I'm so glad Cleo's story had a happy ending. Oh gosh, what a beautiful story of love and kindness. You always make my eyes leak. Beautiful writing and such a beautiful heart. Cleo ended up with the perfect person after all. What a beautiful, sweet story. You're Cleo's angel! I would love to foster, and fospice especially. Thank you, thank you, thank you for raising awareness for such an important topic and for being there for Cleo. Cleo was fortunate that she had someone special who could re-write the ending for her. Your generosity in taking her in for her final two years is a testament to your dedication to shelter pets. I hope your beautiful article inspires others to offer in-home hospice to other shelter pets. Cleo was so lucky to spend her last days with you. You gave her an amazing gift of kindness and love. I do love when something ends well … even if my gut wrenches every time I hear of horrible stories. Hospice care is such a great idea. I do think we need more of that. I literally had tears in my eyes reading about Cleo. Thank goodness they at least called to place the cat rather than just shooting him as that madman threatened. How fortunate she found you and learned what a happy and loving home was. You're so right and thanks for advocating for the dogs and cats who will always be passed over and die, alone, in a cold and lonely environment. I hope this post will inspire others to look for the ones considered "unadoptables." I love that you were able to help Cleo. I have a soft spot for black cats and also animals with attitude. My cat Puck was antisocial with everyone but me and adopted me from the first. He was so special and no one else understood him. There are so many animals in shelters, and I love that you were able to take a sick animal home to give her the love and care she needed. I hope more people do this. Bawling. I do not know who the lucky one is here – you or Cleo. Honestly, these shelter animals give us far more than we could ever give them but I am so happy you took dear Cleo in! Bless you! Now, to get over the anger at that so-called "man" who threatened to shoot Cleo. More like a monster! How lovely you gave Cleo a place to call home for the last years of her life. She spent a long time in the shelter! I was reading something about how dogs deteriorate after spending lengthy amounts of time in the shelter, I imagine cats are the same way. Thank you for giving Cleo love in her last days. When I was growing up, my dad adopted a senior dog that would have otherwise gotten placed in a shelter. I bonded instantly and developed a soft spot for older dogs. This led my husband and I to foster a senior dog. At the time we didn't think of it as hospice, but just knew that no one else was going to adopt him because of his many medical issues. He ended up having three happy years with our family, but also left us emotionally drained. When I began working with community cats, I once again started to feel a tug for older animals. If we can successfully adopt the kitten we're currently fostering, we plan to put our names in at the local no-kill cat shelter as being available to do hospice. This time around we'll better understand what that means. Thanks for sharing your experience. What a sweet ending to a tough life for Cleo. I admire you for taking in a cat needing hospice care. I know how emotionally attached and devastated I get when getting close to an animal, so I'm not sure I could do it. I'm glad you stretched and gave Cleo a home. There was a time in my life when I couldn't do hospice care, but I think I am strong enough now emotionally. I just have to convince my husband. What a touching story. Cleo was so fortunate to have you in her life. Her behavior change showed how much she appreciated being a queen in your household. She will never be forgotten. What a wonderful story. I fostered an elderly kitty with Cerebellar Hypoplasia for almost a year. He was so sweet. I learned so much from him. This post has me in tears. I am so glad that these furbabies have someone to love on them as they prepare to cross the Bridge. It is a worthwhile way to volunteer and love Heavenly Father’s special creations. Brought tears to my eyes, sad and happy. I have fostered kittens but never fospiced. It sounds rewarding yet possibly difficult. I hope to try it someday.